Tablets and smartphones are already part of everyday life for millions of people , who , consequently , are storing an increasing amount of data on their devices . To facilitate access to such valuable information , from anywhere , Kingston has just released the DataTraveler microDuo . In a compact format that combines USB and microUSB , DataTraveler microDuo allows the user to expand the storage capacity of your Android smartphones and tablets with full portability . The DataTraveler microDuo uses the microUSB port devices - normally used to charge the battery - to increase the storage capacity up to 64 GB . This feature is especially useful considering that fewer smartphones and tablets come to market with space for a microSD card . The drive works with any device that can be used as an input for USB ( USB On-The -Go ) and dual interface allows you to transfer files without using a PC as a bridge . Users of smartphones and tablets that take high resolution photos and make HD videos can now easily move their heavy files and free space on the device memory , as in a normal stick.
" The DT microDuo is a great accessory for phones and tablets that allows the user to backup your files from anywhere , transfer them from one device to another and free space on the device with ease ," says Gerardo Rocha , executive director of Kingston in every country . 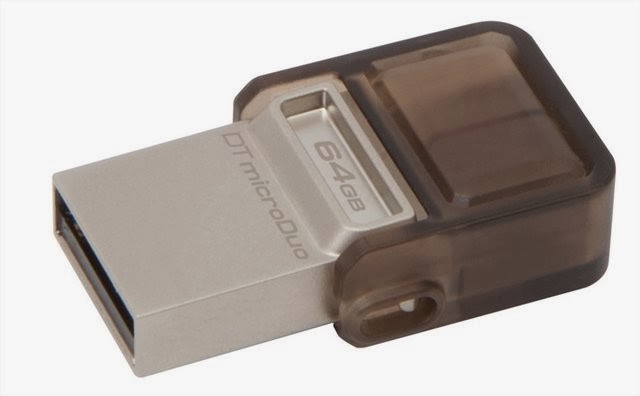 The DataTraveler microDuo is available in capacity of 8 GB, 16 GB, 32 GB and soon 64GB. The suggested prices are 2259 Rs (8 GB), U.S. 3664 Rs (16GB) and 11442 Rs (32GB).